Here we go! Another part in our ‘Nature is Beautiful So Let’s Stitch It’ series! 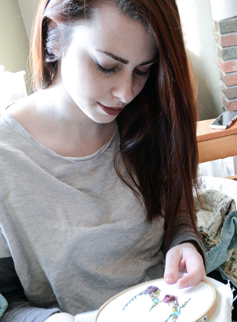 I’m going to show you how I stitch my roses. Once again I’ve got an old tutorial out on my YouTube channel but it’s outdated and badly edited so let’s start fresh. We’re going to pick up the same embroidery and just start where we left off. Remember those leaves we stitched in the previous tutorial? This time I’m not going to start you off with a materials list – I’m just going to explain why we use what as we go. I mean, you know you’re going to need some thread, a needle, and scissors, right? 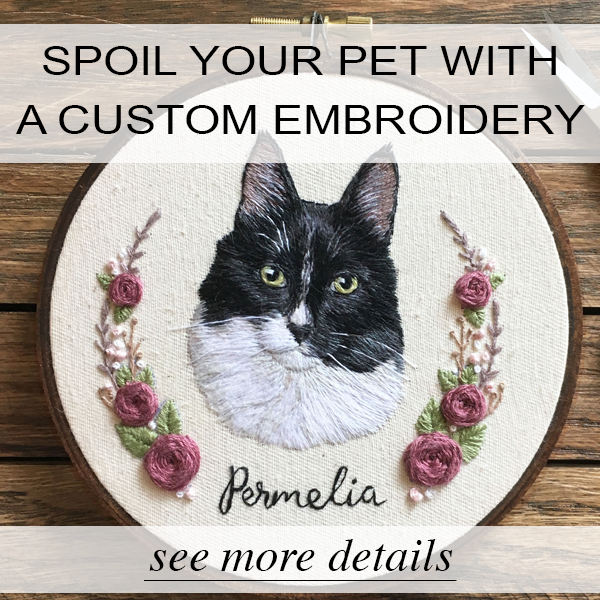 Hopefully you’ve already got the hang of embroidery at this point and are looking for a little something more to add to your pieces! Woah what the heckie-deckie is that thing? It’s a Curved Needle ! Also known as an upholstery needle! You can find these at most craft stores like Jo-Anns and places that have crafting sections in them like Wal-Mart. These are really great for embroidering roses, let me show you why! Start by sketching a circle with your FriXion Pen*. Next, section off that circle like you’re slicing up a little personal pan pizza. For roses that are smaller than a quarter, I use 5 points. If your rose is on the larger size, like bigger than an inch, use seven! Once you’re done, stitch over the guide lines you’ve just drawn. 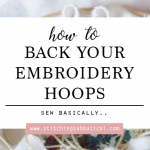 Come up from the back of your embroidery and poke through your fabric between two of your guidelines. Try to make your starting point as close to the middle of your ‘star’ guide as possible! What you need to do is skip every other ‘star leg’ and pull your thread under the stitch. Pull your thread through so your rose isn’t loose, but don’t pull too tight so it becomes a bunched up mess. During this looping part, there is no time where you will poke down through the fabric. It’s all about looping around those star legs! Keep looping under every other stitch and eventually you’ll have a full rose! When I get to the end of my rose I stitch the thread under one of the loops. If one side of your rose is lopsided you can alway just stitch up through the back and add a few more long stitches that curve around the side of your rose. I did that with the one above, can you tell? Here’s a little rose I made with a regular needle. When the roses are smaller or in tight places between other embroidery work, it can be hard to get your needle into those little spaces. Sometimes your rose might get tugged a little too hard while you’re maneuvering your needle and warp. 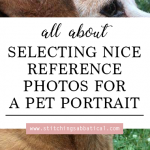 Other times, your needle might catch and pull at what you’ve embroidered around it. Here’s a bunch of beautiful roses all done! Each one looks a little different and I love it! Sometimes my roses turn out really crazy, and sometimes they turn out perfect! They’re one of my favorite flowers to stitch. Here’s some roses I’ve incorporated in my other embroideries! 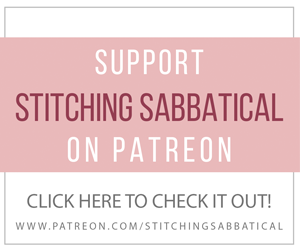 I hope this helped you in your endeavor to learn how to stitch roses! If you use this tutorial to stitch some roses I’d love to see them! 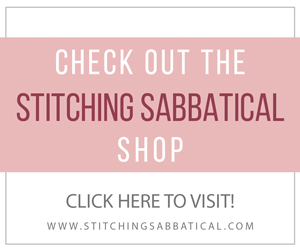 Share your work on Instagram and tag me in your photos @StitchingSabbatical, or use the hashtag #tutorialsabbatical ! Next Post: Olive and the Bean – from beautiful woven wall hangings, to plush home decor! 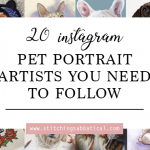 Wonderful talent and beautiful work ..
is it possible to be out your wait list to request a protrait of a cat as gift for a dear friend ?